Scott Walker is an American-born singer-songwriter, composer and record producer. Originally coming to fame in the mid-1960s singing orchestral pop ballads as the frontman of The Walker Brothers, He is noted for his distinctive baritone voice and for the unorthodox career path which has taken him from 1960s pop icon to 21st century avant-garde musician. 2007 And Who Shall Go To The Ball? And What Shall Go To The Ball? The enigmatic figurehead of art rock, a teen idol turned Jacques Brel admirer turned cult pop crooner turned avant-garde vocalist. 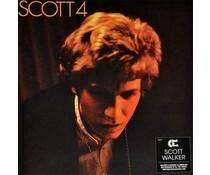 Originally released in 1967 - 2013 reissue on 180 gram audiophile vinyl EU Edition-Scott Walker's first solo album Scott reached the Top 3 in Great Britain and was the first in a string of very successful solo albums.With insert.